*Update: I won 3rd place for this cookie in the chocolate cookies category at the fair! I invented this cookie shortly after my first Chunky experience. I think those candy bars were most popular during the 1980s, but as we weren’t allowed candy growing up, my first taste came as an adult. 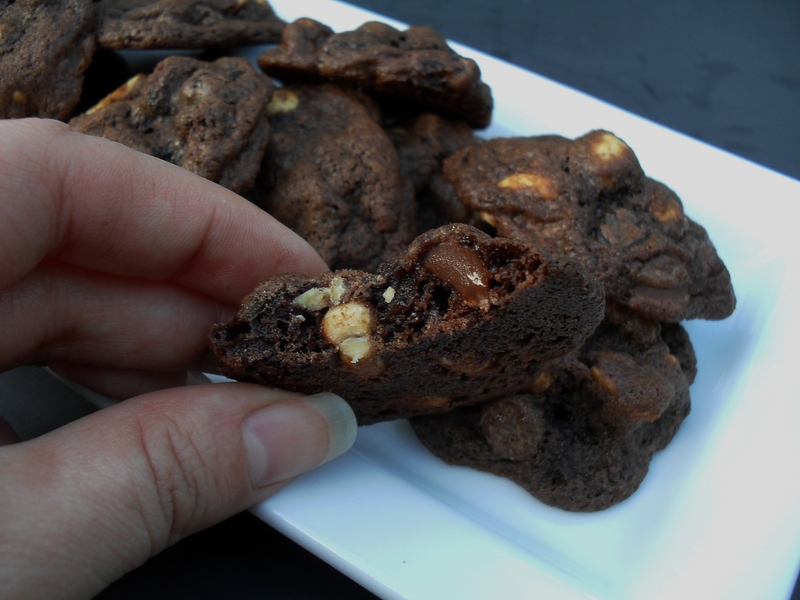 I was surprised by how tasty the odd combination of milk chocolate, peanuts & raisins was and one day decided to put those same elements into a cookie. I thought using regular cocoa powder made them look too bland so I used dark cocoa instead, and I think that not only helps the visual appeal, but gives the cookies a deeper chocolate flavor as well. I suppose it’s up to personal tastes as to how much you will like this cookie, but they are my second favorite cookie of all time. I like them more than the candy bar! Cream the butter and sugars together until blended and fluffy, about five minutes. Add the egg and vanilla and mix well. Sift in the flour, cocoa and baking soda and mix just until combined. Stir in the remaining ingredients. Mound large spoonfuls, about ¼ cup per cookie, onto an ungreased, parchment-lined, cookie sheet about 2″ apart. Flatten with a spatula until each cookie is almost 2 inches in diameter. Bake for 10-15 minutes or until the edges have just begun to firm. Remove from oven and allow to cool on the cookie sheet for one minute, then transfer to a wire rack. * Repeat with remaining dough. Makes about 16 giant cookies. 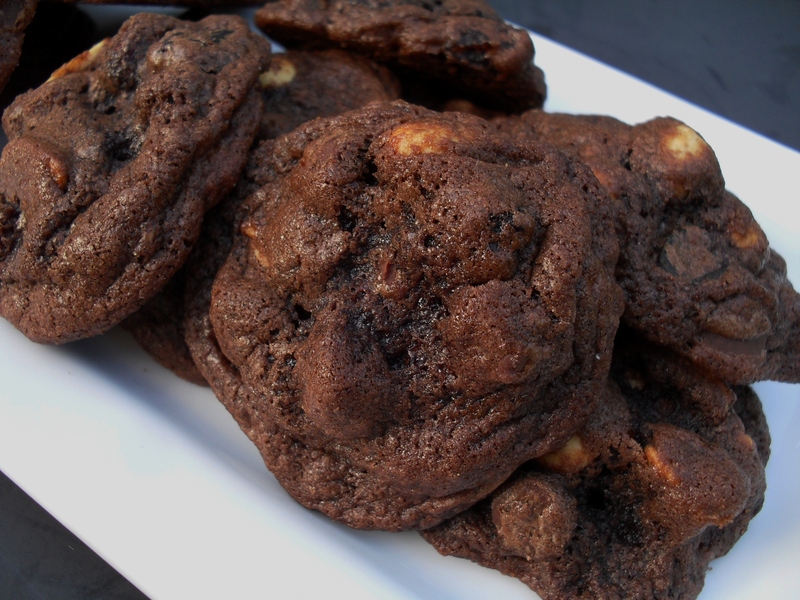 *I always underbake cookies to ensure that they are soft and chewy after cooling. Depending on how soft they are when I remove them from the oven, sometimes I have to leave them to cool completely on the cookie sheet so they can continue baking while they cool and set them up a little more without over-baking. If you try to remove a cookie to a cooling rack and it’s too doughy, just leave them to cool completely on the sheet. If you can remove it easily, do it or they will not be as soft after cooling. Posted in Cookies and tagged chunkies, chunky, Cookies, dark chocolate. Bookmark the permalink. I am going to make these today! They look delicious! I love your blog and have tried several recipes. I niter foods in the Iowa State Fair! Very cool! So happy to meet another fair-entry baker! These are delicious! I made 6 batches for an event! There are none left! I entered these in the Des Moines Register Holiday Cookie Contest and added brandied Cranberries. They finished in the Top 10 and were so GOOD! Oh that does sound amazing!! How did you brandy the cranberries – just soak dried cranberries in brandy?